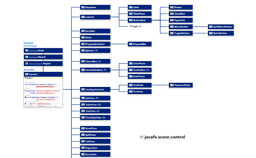 This website presents enhanced Java class diagrams. 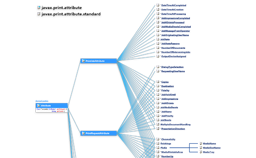 The diagrams are interactive and allow access to the complete API documentation. Please see the video for more information. 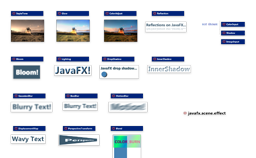 The site now contains diagrams for Java 10 and JavaFX 10. The differences in the Application Programmer Interface (API) between Java 9 and Java 10 are very small. There is only one new public class and only 75 new methods. Therefore I decided to remove the Java 9 diagrams totaly and handle the Java 8 release as the previous version of Java 10. 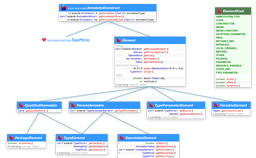 The red exclamation marks in the Java 10 diagrams therfore show all elements that have been added since Java 8. A new PayPal link has been introduced to give users the option to help out by donating with PayPal. There is new content for the Patreon campaign. 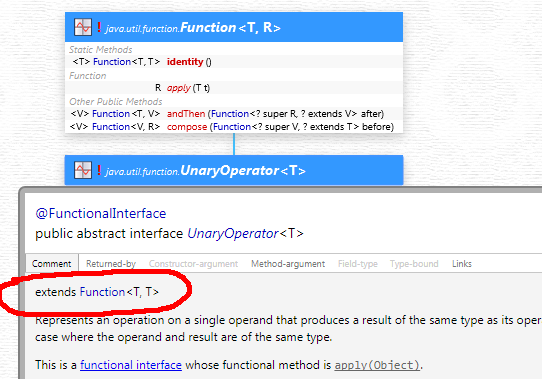 Now all classes in java.util are available in high resolution for printing. And there are 3 extra diagrams for JUnit and Mockito. Also there is now some heuristics to avoid page boundaries going through type panels. The diagrams are already updated to Java 10. The @implSpec tag was added in Java 8 and used heavily in Java 9. This tag should be enabled by default, but as of Java 9, the Javadoc utility still ignores it. Indeed, the @implSpec tag is not shown in the official Java Documentation of Java 9. One of the few ways to see these tags is on this site. The @implSpec tag is always shown here. 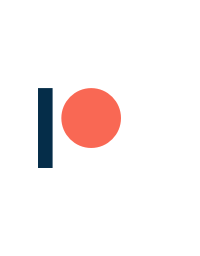 I started a Patreon campaign. The intention is to gather funds to continue to host, manage and update this site. As reward I offer high resolution images of the diagrams in pdf and png format. This month will start with JavaFX. The guestbook was retired. Because of the massive spam in the old guestbook I required an extensive captcha. This made the guestbook quite difficult to use and in the end spam got still through. As replacement I will now use Twitter. Please go there if you want to leave a comment and follow me if you want to get noticed of updates. 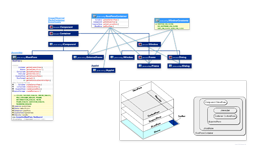 Also the Java 9 diagrams have been updated to use the sources from JDK 9.0.4. Clicking the use of a type now reveals a pop-up with the complete type panel. The added type panel is fully interactive. All doc comments of the pop-up type are accessible. Click to view an animation. 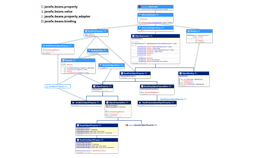 Class diagrams for JavaFX 9 have been added. On a new MacBook with retina display the class diagrams of this website look not satisfactory. A retina option for high dpi displays is introduced to remedy this problem. 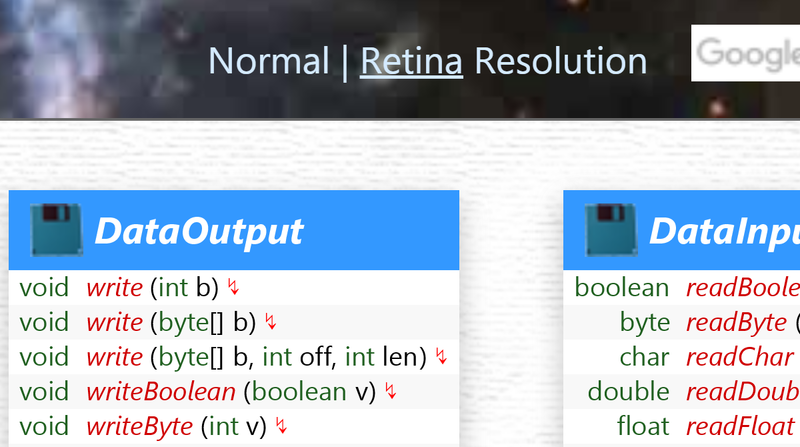 The retina option is not enabled by default, because the readability on standard dpi displays is better without it. 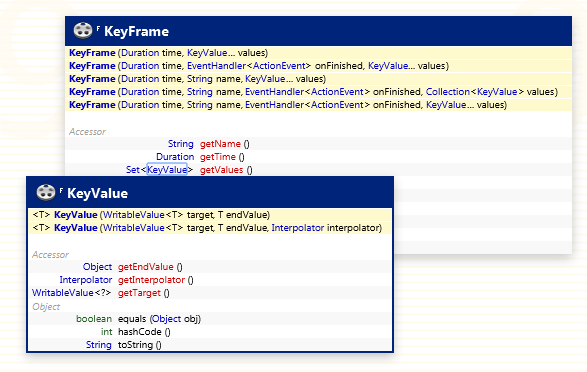 Inheritance information is now included in the JavaDoc comment of a type. This is necessary because the full information about generic super types can not be displayed otherwise. Update: the inheritance information is now displayed after the main comment. The FAQ now contains a Disqus forum. Big update! 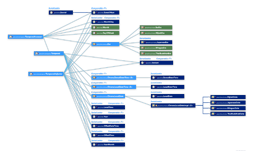 New class diagrams for all classes of the Java 9 standard edition added. The exception are the JavaFX classes which will be added in the next release. Furthermore, the functionality of the website has been improved in two regards. Pop-up windows for types now contain links to instances where the type is used. The links are organized in different categories. More information can be found in the description pages . Click to view an animation of the different tab contents. Hidden elements could already be displayed by clicking the hidding notification. The JavaDoc comments of these hidden elements can now been further revealed by a consecutive click. Click to view an animation of progressive disclosure in action. The diagram explanation pages have been revised. Many thanks to Mark Eifert for his support. Also the Google site search for the Java 7 diagrams seems to work now. 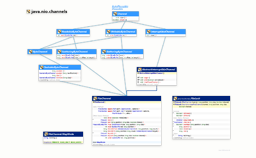 Class diagrams for Java 7 have been added to the website. 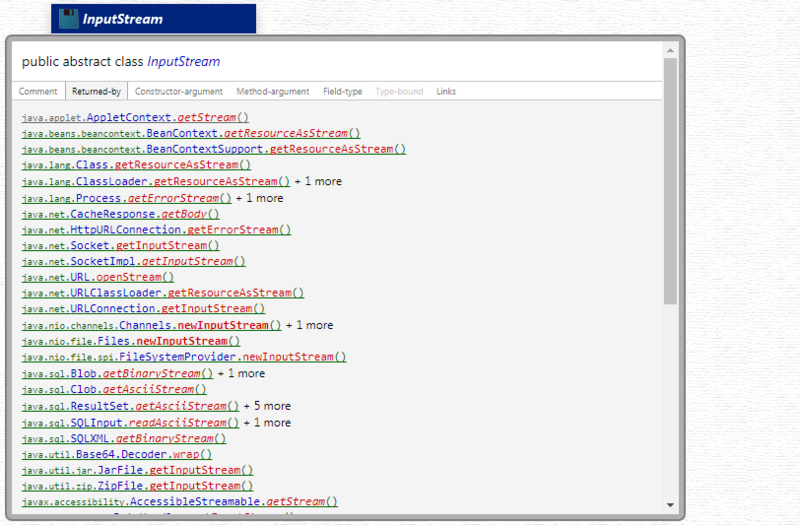 The site search for the Java 7 diagrams will most likely not work until Google indexes the new pages. 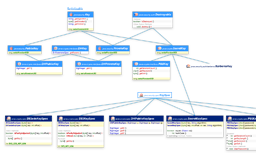 In the next days I will start a poll to see if there is interest for Java 6 class diagrams. 1. The Diagram explanation pages have been updated. 2. 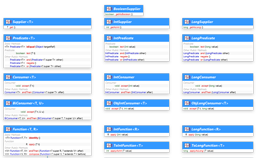 Now the class diagrams for JavaFX also contain links to the relevant chapters of "The Java Client Tutorials". More links to other resources will be added in the future. 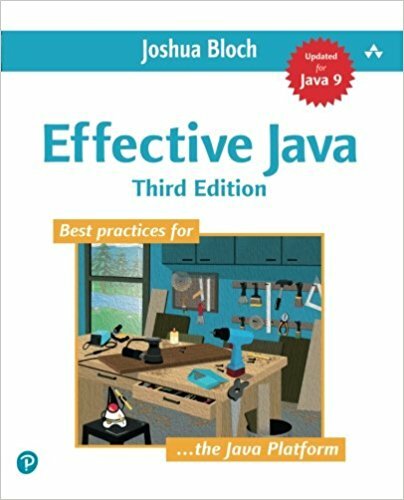 Input of the Java community would be appreciated. If YOU think a diagram could benefit from an useful link, please notify me by email or the contact formular. 3. The Google site search in the upper right corner works again as intended. 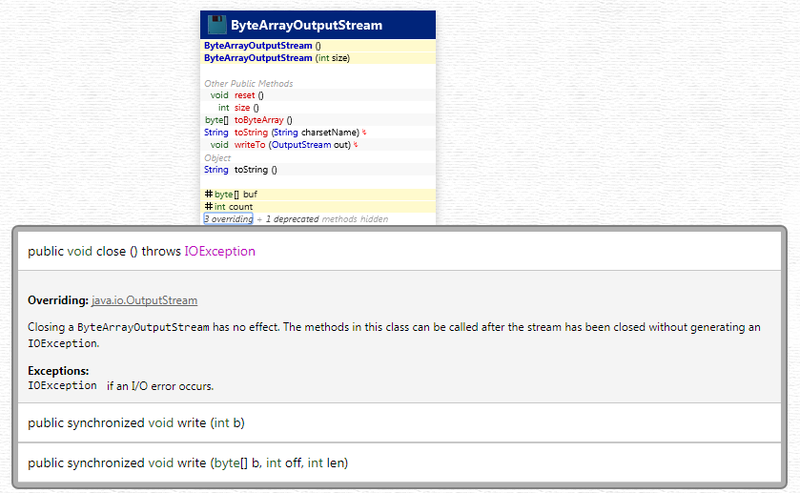 The class diagrams for Java 8 now contain links to the relevant chapters of "The Java Tutorials".